Mackenzie Skapski, one of the top goaltending prospects in the Rangers organization, had hip surgery on tuesday to repair a muscle tear. Photo courtesy of Getty Images. New York Rangers goalie and prospect Mackenzie Skapski had arthroscopic surgery to repair a labral tear in his right hip, with the procedure taking place on Tuesday. He is expected to be sidelined for 4-5 months, which will put him out of action until sometime in October or November. Skapski was called up on Febrary 4th following the vascular injury to Henrik Lundqvist, and backed up Cam Talbot for seven weeks. Dubbed the “Buffalo Killer” by head coach Alain Vigneault, Skapski made his first two career starts at the First Niagara Center against the Sabres, winning both games. 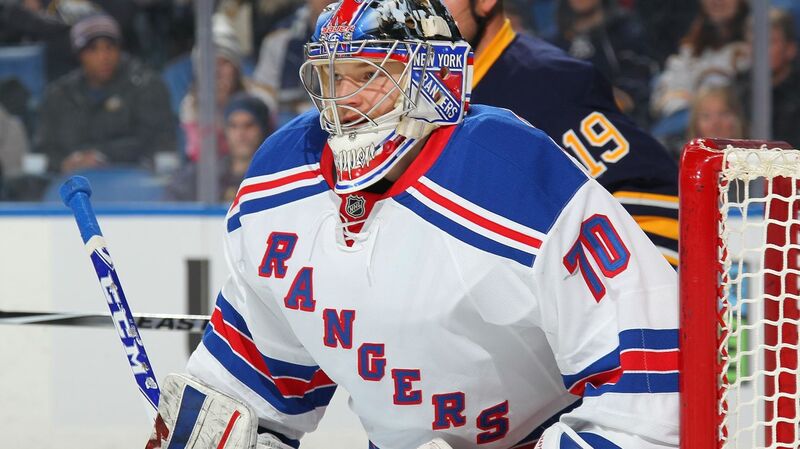 On March 14th, in his second career start, the 20 year old shut out the Buffalo Sabres, become the first Rangers goalie since 1957-58 to post a shutout in one of his first two starts. Skapski was 2-0-0 with a .50 GAA and a .978 save percentage in two games. Skapski suffered an injury near the end of the regular season with the Hartford Wolf Pack, prompting them to go with Yann Danis during their run to the Eastern Conference Finals. Skapski was 15-8-3 with a 2.40 GAA, a .914 save percentage and three shutouts. Skapski’s injury does make the Cam Talbot situation a bit more complicated. Talbot is under contract for next season, but the Rangers may wind up trading him while his value is high. Talbot was marvelous in replacement of Henrik Lundqvist, finishing the season with a 21-9-4 record, a 2.21 GAA and a .926 save percentage. Skapski could be viewed as the number three goalie in the Rangers organization, but he was never expected to be the backup for next year’s team. The plan for Skapski is to get him starts in the AHL, and be the number one goalie there. That means that if the Rangers do decide to trade Cam Talbot, who has a low cap hit of just $1.45 million next season, they will need to look for a backup from outside of the organization. Behind Skapski and Yann Danis is Cedrick Desjardins, 29, who is recovering from a torn ACL, and the 19 year old, 6-foot-4 Brandon Halverson, who is expected to stay in juniors. There will be a few veteran backups on the free agent market, including Jhonas Enroth and Anders Lindback, who could be serviceable backups. But as of right now, Cam Talbot is slotted to be the backup for next season. Read about Mackenzie Skapski’s incredible journey to the NHL here. Posted on June 3, 2015, in Rangers Updates and tagged Brandon Halverson, Cam Talbot, Hartford Wolf Pack, Hartford Wolf Pack Skapski, Hartford Wolfpack, Hartford Wolfpack Skapski, Henrik Lundqvist, Mackenzie Skapski, Mackenzie Skapski injury, Mackenzie Skapski surgery, Madison Square Garden, MSG, New York Rangers, NY Rangers, NYR, Rangers, Skapski, Skapski injury, Skapski surgery. Bookmark the permalink. Leave a comment.